Hines is coming on board as a co-developer of a West Los Angeles megaproject, The Real Deal has learned. The Houston-based firm paid north of $200 million to become a partner on the 807,000-square-foot project being developed by the Martin family. The Martins have long owned car dealerships on the 4.6-acre site at 12101 W. Olympic Boulevard and secured entitlements for the development last year. Designed by Gensler, the Martin Expo Town Center would include 619 apartment units, as well as 150,000 square feet of office space and about 100,000 square feet of retail. The Martins listed a 49-percent stake in the property with Eastdil Secured over the summer. At the time, the family wanted to maintain a stake in the project but take some cash out of the deal, rolling the remainder of the proceeds into a joint venture to develop the project, sources said. The specifics of the deal it ultimately reached with Hines are unclear. Dan Martin of Martin Automotive Group could not be reached for comment, nor could representatives of Hines and Eastdil. The project sits one block away from the Expo Line’s Expo/Bundy station, next to Kilroy’s Westside Media Center, the home of Riot Games. The area has seen a significant uptick in development in recent years. CIM Group recently proposed a 154-unit mixed use development in West L.A., at Santa Monica Boulevard, between Stoner and Granville Avenues. 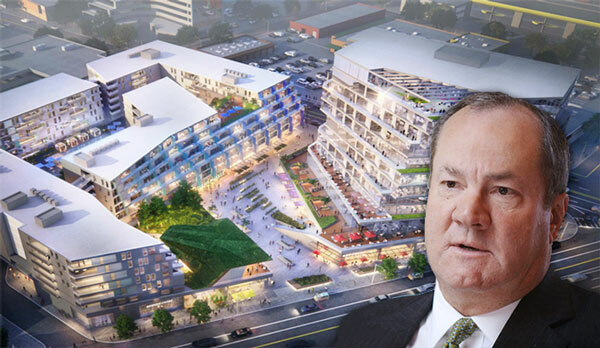 Alan Casden’s Casden West L.A. development, a project with nearly 600 units, recently broke ground at Pico and Sepulveda Boulevards. Hines, a prolific owner in L.A., has recently been selling off many of its assets. It sold a five property portfolio in the Warner Center to Oaktree Capital earlier this year, and traded its building at 12100 Wilshire Boulevard to Douglas Emmett last year. Hines gave up on its plans to develop a 1.1 million-square-foot project on the site of the Pen Factory in Santa Monica after anti-growth activists created a ballot measure to squash it, despite the fact that the development had already been approved by the City Council. It sold the site to Clarion Partners, which ultimately partnered with Lincoln Property Company to build a smaller office project.